Chandler strawberry plants are a vigorous, early, mid-season variety. They winter well with just a layer of straw and are an excellent "pick your own" variety. 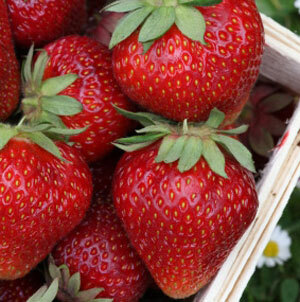 Chandler strawberry plants are resistant to Powdery Mildew. The June-bearing 'Chandler' Strawberry plant produces medium to large, beautifully wedge-shaped juicy fruit with exceptional flavor. It may produce earlier in warmer climates, is mildly salt tolerant and under the optimal growing conditions will produce about 1-quart per bush over a 3 to 4-week period. Chandler is a favorite due to its high yield. All our 'Chandler' Strawberry Plants are organically grown and shipped in fine quality growing medium. They are guaranteed to arrive alive and ready to plant. Comment: Very, very happy. My strawberries arrived exactly when I expected them to and every plant was beautiful and healthy. I am so looking forward to my first strawberry harvest next spring. Comment: They arrived when promised and all 25 of them were in perfect condition. Within a week are twice as big! Comment: Excellent service. Excellent plants. Comment: This is the second year that I have ordered Chandler strawberry plants for fall planting from GrowJoy . Once again, the plants arrived in a timely manner and were in good shape upon opening the container. It has been over a week since they were planting (according to instructions) and they are thriving. We look forward to our first crop next spring. Comment: I want to say that these are some of the nicest looking strawberry plants that I have ever purchased. They were shipped and received promptly too. Thanks again! Comment: My strawberry plants arrived in perfect condition. After more than two weeks in my garden, all 25 plants are growing and thriving. I'm very happy with this product and this seller. Comment: We ordered 25 plants; they shipped quickly and arrived in great condition. The plants were healthy and looked great. We planted them today and can't wait until Springtime! Comment: I ordered the 25 strawberry plants and planted my raised garden bed in September for next season's harvest. The plants arrived in beautiful condition and after a week in the garden are looking fabulous. Excellent shipping and service, really looking forward to strawberry season!